Way back in the cold, crisp days of February I took a day trip to Worcester. A bit far perhaps for a day trip, but I still have in my Canadian blood the tolerance for taking 4+ hours to get somewhere. London Midland trains were doing a sale for a couple of weeks where you could buy basically a day pass for their network for £15. One would be crazy not to grab that. 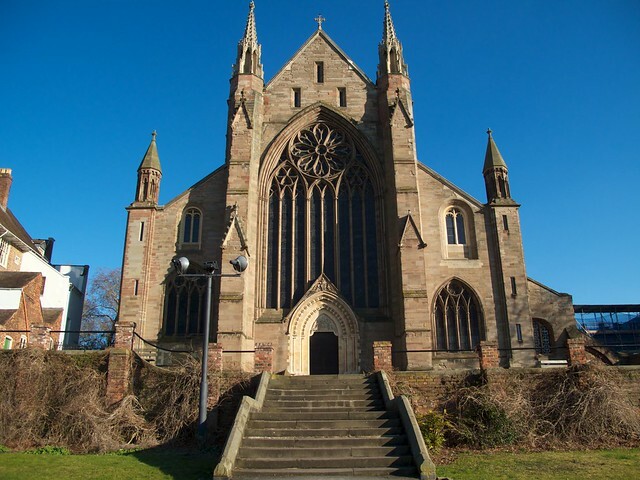 I wasn’t too familiar with many of the towns and cities their network covered, but Worcester stood out as being an old town with a medieval cathedral to check out. Up and at them early on a Saturday morning to get to Euston for the first leg of my journey to Birmingham. There was a problem with some frozen points along the tracks near Leighton Buzzard that slowed us down a bit. But hey as long as I got there while it was still daylight I wasn’t too bothered. I was tempted to have a quick peak at least around Birmingham New Street Station but I didn’t have much time at all to catch my next train that would take me to Worcester. Ah well, I don’t reckon it could have changed too much since I was last there four years ago. 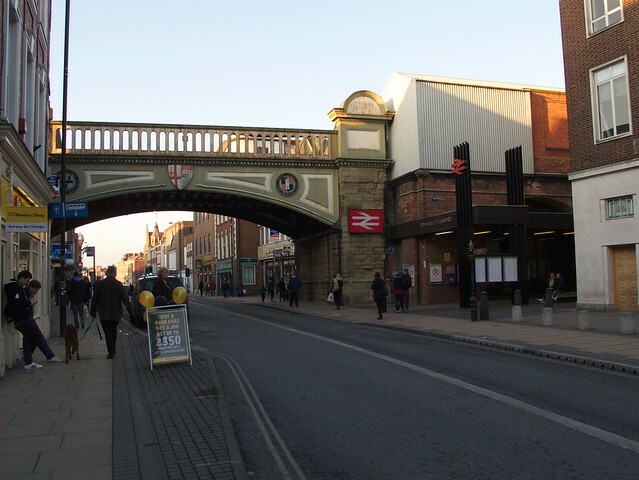 I arrived at Foregate Station, one of two stations in Worcester. The other one being Shurb Hill which I thought was too far out of the centre of the city, but that really wasn’t the case. Anyways, enough about rail stations. This is about the cathedral. 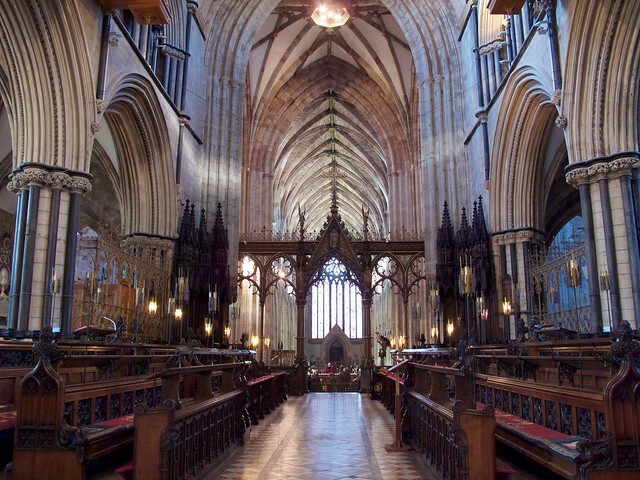 Worcester Cathedral, or to call it by its full name of The Cathedral Church of Christ and the Blessed Mary the Virgin of Worcester, was built between 1084 and 1584. With such a long construction time, it ended up representing every English architectural styles on the go for those 500 years. If you ever want to have a peek at what the cathedral’s west facade looks like, just flip over a £20 note printed between 1999 and 2007. It’s there along with a portrait of Sir Edward Elgar. 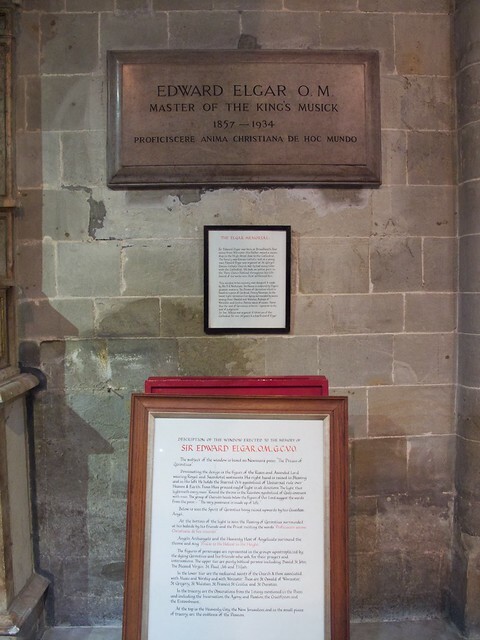 There is a memorial to him inside the cathedral. 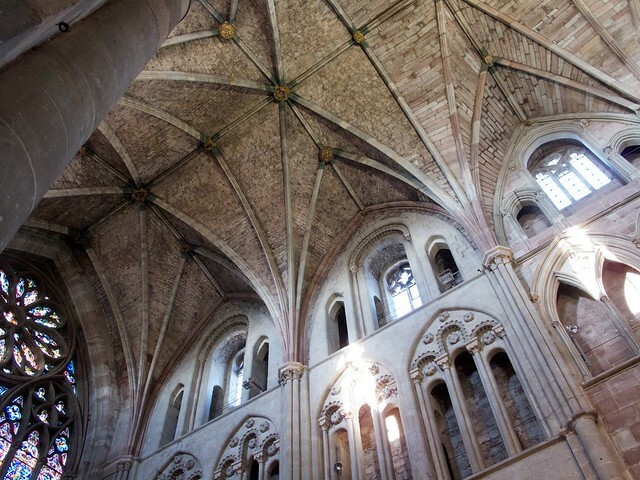 Rounded Norman arches on side and pointed gothic arches on the other. You can see the brickwork of the ceiling change as well between the two stages of building. 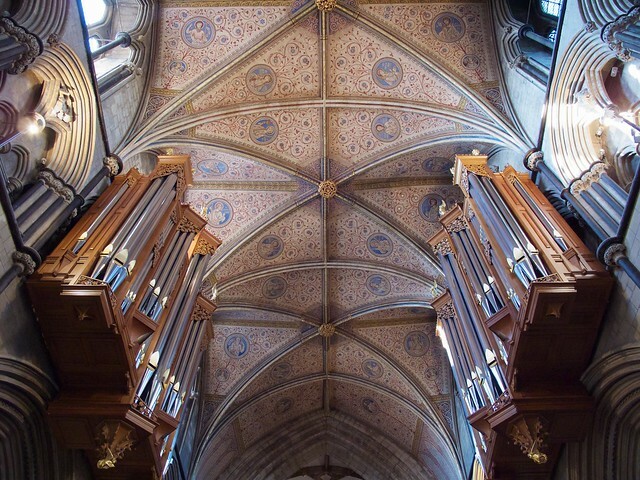 … and looking up in the choir. Nice pipes.